WTF? North Korea Nuclear Progress Puts Iran on Renewed Pathway to Nuclear Bomb Sources told the Washington Free Beacon that Pyongyang continues to stockpile illicit nuclear material on Iran's behalf in order to help the Islamic Republic skirt restrictions implemented under the landmark nuclear deal. North Korea's latest nuclear test of a hydrogen bomb has roiled Trump administration officials and led President Donald Trump to consider multiple options for war. However, it also has renewed fears among U.S. officials and foreign policy insiders about Pyongyang's long-standing relationship with Iran, which centers on providing the Islamic Republic with nuclear technology and know-how. U.S. officials are closely monitoring an ongoing meeting between senior North Korean and Iranian officials that comes on the heels of a nuclear test by Pyongyang, according to senior Trump administration officials and other sources who expressed concern that North Korea is helping to put the Islamic Republic back on the pathway to a functional nuclear weapon. Sources told the Washington Free Beacon that Pyongyang continues to stockpile illicit nuclear material on Iran’s behalf in order to help the Islamic Republic skirt restrictions implemented under the landmark nuclear deal. North Korea’s latest nuclear test of a hydrogen bomb has roiled Trump administration officials and led President Donald Trump to consider multiple options for war. However, it also has renewed fears among U.S. officials and foreign policy insiders about Pyongyang’s long-standing relationship with Iran, which centers on providing the Islamic Republic with nuclear technology and know-how. The head of North Korea’s parliament arrived this weekend in Iran for a 10-day visit aimed at boosting ties between the two countries amid an international crackdown on Pyongyang’s nuclear weapons program, a situation U.S. officials tell the Free Beacon is being closely monitored. As North Korea makes progress in its nuclear pursuits, it is likely this information is being shared with senior Iranian officials who continue to maintain and build upon the country’s weapons program, despite the nuclear agreement, which only limits a portion of Iran’s nuclear enrichment and research abilities. One senior U.S. official currently handling the Iranian and North Korean nuclear portfolios told the Free Beacon that the collaboration between these two countries is being closely monitored by the Trump administration, which will not hesitate to take action to disrupt this relationship. Iran and North Korea have long collaborated on their missile programs and nuclear technology, and the U.S. intelligence community continues to monitor ongoing efforts by the two countries to boost cooperation. Kim Yong Nam, the head of North Korea’s parliament, reportedly arrived in Iran on Thursday for a high-profile meeting with Iranian President Hassan Rouhani that is likely to center around Tehran’s quest for technology and North Korea’s need for hard currency and financial assets. Iran has been flush with cash and other financial assets since the nuclear agreement lifted international sanctions and opened the Islamic Republic to new business ties. Rep. Ron DeSantis (R., Fla.), a member of the House Foreign Affairs Committee and the National Security Subcommittee, told the Free Beacon that the increased ties are cause for concern, particularly in light of Iran’s renewed economic success. North Korea’s latest nuclear test has sparked a fierce war of words with the Trump administration, which announced on Monday that it is considering a range of military options. United Nation’s Ambassador Nikki Halley said that North Korean leader Kim Jong Un is “begging for war” and urged the U.N.’s Security Council to consider a strong response. Israeli officials also have warned that North Korea’s latest test is a boon to Iran’s own nuclear program. Iran and North Korea have been sharing nuclear materials and know-how for well over a decade, according to sensitive intelligence community communications published by WikiLeaks and dating as far back as 2009. The Obama administration took little action during its time in office to thwart this growing alliance, leading to increased nuclear ties between Iran and North Korea, multiple sources said. 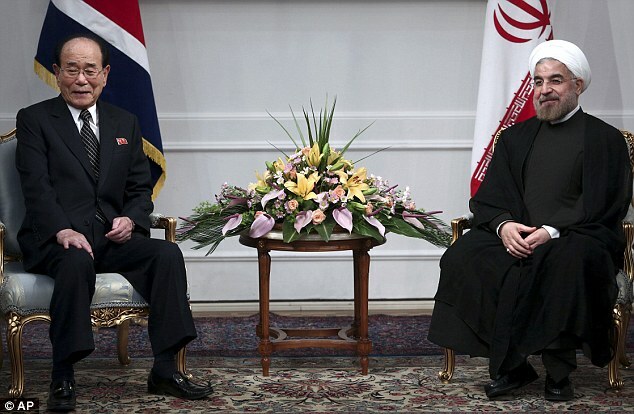 In order to comply with the nuclear agreement, Iran outsourced much of its nuclear technology to North Korea, according to multiple sources, who pointed to evidence of a key 2015 meeting between the two countries surrounding the nuclear portfolio. Iran also has opened ballistic missile factories in Syria with the help of Russia and North Korea, according to regional reports. “North Korea and Iran’s military and political ties are long-standing, and can be traced back to the 1980-1988 Iran-Iraq War, the same time that Tehran developed an interest in nuclear and missile technology,” said Behnam Ben Taleblu, an Iran analyst at the Foundation for Defense of Democracies. “North Korea’s provision of the Nodong-A liquid fueled medium-range ballistic missile to Iran in the 1990s enabled the mullahs to make significant strides in the missile program and eventually even their satellite launch-vehicle technology,” Ben Taleblu explained. “While some may see the long-standing missile relationship as merely evidence of the two countries’ interest in conventional munitions, these missiles are capable of carrying nuclear payloads, and offer both rogues the ultimate deterrent weapon with which to ensure regime survival,” he said. Iranian officials and scientists have been spotted at several of North Korea’s key nuclear test, fueling speculation that the two countries are in close contact on the issue. “What is almost certain, however, is the following: both in the post- and pre-JCPOA [or Joint Comprehensive Plan of Action, the formal name for the Iran deal] era, the two closely watched how each one negotiated with the international community, what deals it struck, the lies that worked and didn’t work, and where and how it could supplement resolve for material capability,” Ben Taleblu said. Michael Rubin, a former Pentagon adviser and expert on rogue regimes, further told the Free Beaconthat it is suspected North Korean officials played a role in helping Iran recently test fire a series of ballistic missiles, which sparked international outrage and accusations the Islamic Republic is violating legally binding bans on such behavior. One veteran congressional foreign policy adviser who works on the Iran portfolio told the Free Beacon that efforts to promote a new North Korean nuclear deal in the same vein as the Iran agreement are fruitless, and would only strengthen Pyongyang’s appetite to publicly test its nuclear weaponry. Rubin went on to describe the North Korean stand-off as a glimpse into future situations with Iran. The head of North Korea's parliament arrived this weekend in Iran for a 10-day visit aimed at boosting ties between the two countries amid an international crackdown on Pyongyang's nuclear weapons program, a situation U.S. officials tell the Free Beacon is being closely monitored. As North Korea makes progress in its nuclear pursuits, it is likely this information is being shared with senior Iranian officials who continue to maintain and build upon the country's weapons program, despite the nuclear agreement, which only limits a portion of Iran's nuclear enrichment and research abilities.